1. Your app can't handle Korean letters. Consonants and vowels are separated. Hangul combines consonants and vowels to complete a letter. This problem is happened almost 30 years ago but it is appearing in your app. 2. Your app can't handle Korean fonts. Your app change Korean fonts randomly. 3. 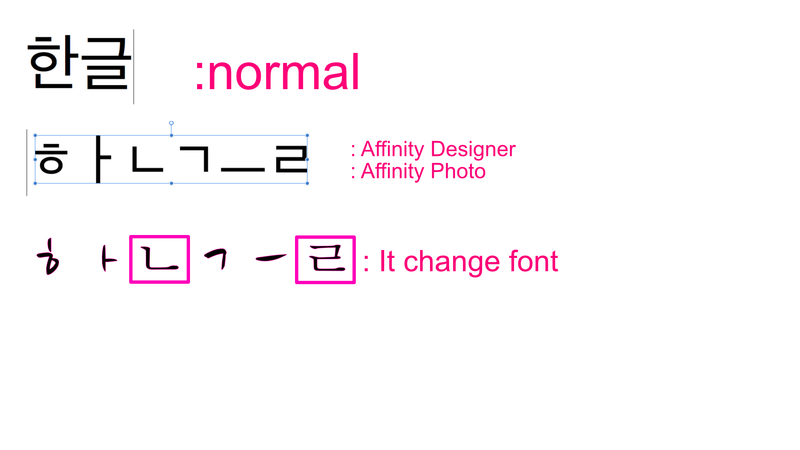 Your app do nothing when I change a Korean fonts in same sentence. The problem with the characters appearing incorrectly has been fixed by development and should be made available in the next beta. However I don't believe we're aware of any issues with the fonts being changed randomly or changing fonts in the same sentance. Can you use QuickTime to record a video of those two issues please? 잘못 표시된 문자의 문제점은 개발로 해결되었으며 다음 베타 버전에서 사용 가능해야합니다. 그러나 우리는 글꼴이 무작위로 변경되거나 동일한 문장에서 글꼴이 변경되는 문제를 알고 있다고 생각하지 않습니다. QuickTime을 사용하여이 두 가지 문제에 대한 비디오를 녹화 할 수 있습니까? not exactly same but similar (It just random). Affinity Designer has same problems. Please can you try the latest Affinity Designed for Mac beta which has changed this code. This beta will install side by side with your release version. Affinity Photo for Mac beta will follow suit with this input change soon. I tried the beta version. 2 things. 1. GOOD : Consonants and vowels are not separated. 2. SAD : It still does nothing when I change Korean fonts in same sentence.